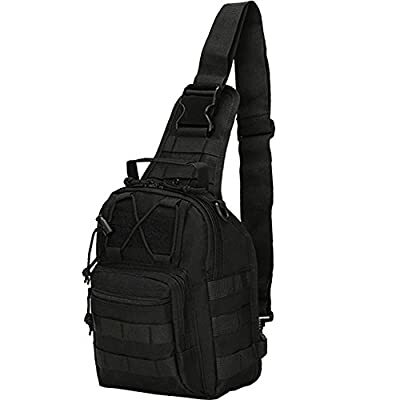 Novemkada Tactical Shoulder Bag is the perfect compact solution for organizing and carrying your gear for EDC, hiking, camping, hunting, attending sports events, school, or working outdoors. A generous number of dividers, straps, clips, loops, pockets, and snaps give this MOLLE compatible pack endless configurations for whatever your specific needs are. Heavy on utility, it allows you to configure your pack to carry it as a shoulder bag, chest pack or simply hand carry it by the hand strap. - Innovative single ambidextrous sling shoulder design. - Main compartment with two pockets and front lower compartment with elastic organizer loops and key retention. - Features a spacious main compartment with zip-up closure, mesh pockets and front storage zip-up compartments. - Secure to your back with an adjustable chest belt and hip belt clasp. - Padded and adjustable shoulder straps relieve pressure on shoulders while carrying heavy loads. - Breathable mesh backing provides a comfortable feel in hotter weather. - Double zipper pulls on every compartment for easy access. - Various attachment points for modular expansion. ?PREMIUM MATERIAL: Novemkada Tactical Shoulder Bag is made of sturdy 1000D fabric nylon material, lightweight and water resistant. It is long lasting and hard to be dirty. ?MOLLE SYSTEM :Molle webbing system is ideal for attaching knives, flashlight holster, interphone pouch, water bottle bag and other molle gears. The hook&loop on the front of Molle Sling Backpack is designed for the your own customized patch. ?ADJUSTABLE STRAP:The shoulder sling is adjustable in length to fit people in different shapes and sizes, and there is no limitied backward arm movement. Two clips on the two sides make it switched between left or right hand side, suiting your body shape. ?MULTI PURPOSE: Used for EDC sling pack, chest bag, hand bag, tactical versipack, pouch, first-aid kit, diaper bag and so on. It is very handy and convenient. Great for indoor and outdoor uses including camping, hiking, hunting, sports events, school supplies, tools, etc. ?LIFETIME WARRANTY AND MONEY BACK WARRANTY:Order now and if you dislike it within 90 days, we will buy back from you, 100% RISK FREE!